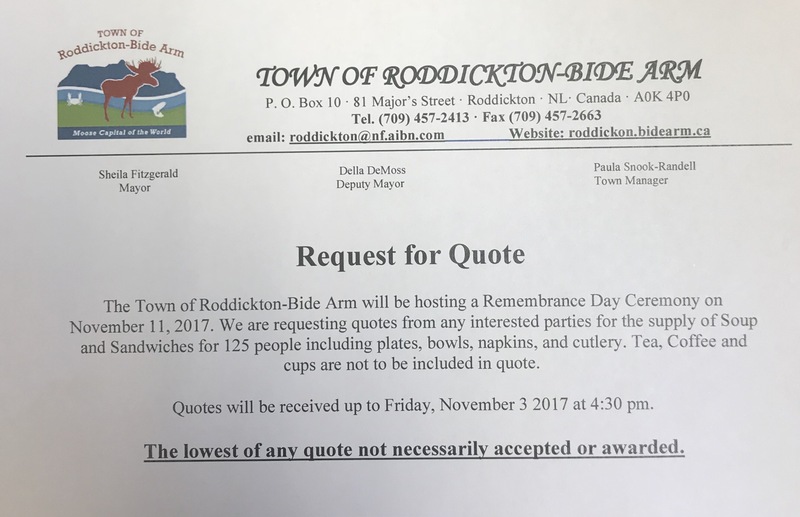 The Town of Roddickton-Bide Arm will be hosting the Remembrance Day Ceremony on Friday, November 11, 2016. Any resident/group who would like to participate in the ceremony either by singing or reading a poem are asked to contacted the Office at 457-2413. In the event there are a large of persons/groups interested names will be drawn. Interest parties who will be laying a wreath are also asked to contact the office with your name. NOVEMBER 11th, 2015 starting at 10:45 a.m. Following the service refreshments will be served at the Gerry Byrne Room. 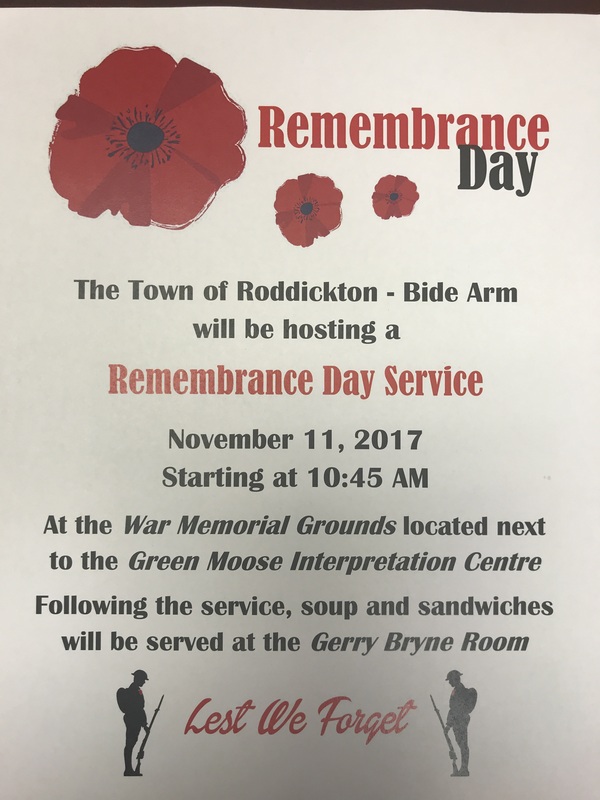 On Remembrance Day, Nov 11, the Town will be holding a Remembrance Day Ceremony. Individuals or Organizations who would like to lay a wreath please contact the Town Office at 457-2413. Details on the Ceremony to follow. More than 100 people attended Remembrance Day Ceremony Sunday morning at the Veterans Memorial Park. The crowd paused two minutes of silence to remember those who gave their lives for the freedom we enjoy every day. It’s a moment when generations are united. The solemn ceremony was also observed with singing O Canada, Ode to Newfoundland and God Save the Queen were led by Sheila Adams & Wesley Cull. We listened to the playing of The Last Post and Reveille as well as prayers offered by Pastor Rene Cassell. While Cloud River Academy Choir sang “I’ve got peace like a river” the congregation joined in. Wreaths and poppies were laid by representatives of the Municipalities, Military family representatives, Canadian Rangers, RCMP & Ministerial Association. Pastor Pinksen devoted time to remind us, Greater love hath no man than this, that a man lay down his life for his friends. Taken from bible scripture John 15:13. In his remarks, Master of Ceremonies Deputy Mayor Wade Reid thanked each one for coming out to the important ceremony. After the ceremony soup and sandwiches was provided at the Gerry Byrne Room, catered by our Come Home Year Committee. Remembrance day was a moment when we remembered those who have been lost, in current conflicts and previous ones. Showing our gratitude to them, and standing in sorrow with their families. A country united in remembrance for the men and women of our forces. We will never forget their service, we will always remember!